General construction contractors don’t need a license to work in Maryland. You will need a license to do electrical, plumbing or HVACR contracting, or work on home improvement projects. Plumbing, HVAC, and home improvement construction mandate the contractor to have a state license. Other construction work will require the contractor to obtain registration based on the jurisdiction. Step One: Each applicant is required to complete and pass the licensure examination prior to applying for the license. Within the course, each individual will be given all the forms and information that will be necessary when it comes to applying for the license. You may also view the website for Maryland Department of Labor, Licensing and Regulation – http://www.dllr.state.md.us/license/mhic/mhicaff.shtml – There will be forms, fees, and applications available via the above website. Step Two: This is the step that is needed to apply for licensure from Maryland Home Improvement Commission. An applicant who previously had a conviction of a misdemeanor that relates to a felony or home improvement will be required to provide copies of the conviction records to Maryland home Improvement Commission. Individuals who are applying for a contractor license will be required to provide proof of the prior two years experience with construction, home improvement work, and other education that is relevant. If any contractor is representing a corporation, the articles of incorporation, as well as certificates of good standing must be submitted from The Department of Assessments, as well as taxation. A contractor using a trade name must first check with the Commission to make sure the name is available for use with the Commission and then register the name with the Department of Assessments and Taxation . A trade name or certificate registration will need to be sent in along with a license application. There will need to be proof of the $50,000 liability insurance, and it is required to be filed when applying for the license. Each contractor will need to provide proof of the $50,000 liability insurance during the application process, which is for the original and renewal licensure. The insurance will need to remain in effect during all times. As of October 1st, 2002, each contractor will need to give the commissions a notice for cancellation for liability insurance, which will need to be at least 10 days prior to the cancellation effective date. For any license that was issued before July 1st, 1999, the licensee had received a personal renewal date in which the license will need to be renewed each every two years. All licenses that were obtained after the date of July 1st, 1999, the license period will be two years from the date of the original license. No temporary issues are issued any longer. The provision was removed for temporary license during the year of 1999. Each application will need to complete and pass the licensure examination prior to applying for the license. Each application who received a conviction regarding a misdemeanor in relation to a felony or home improvement transaction will be required to provide copies of the records with the Commissions. The Home Improvement Licensure will not cover the “new home construction”. Each builder who builds homes in the state of Maryland will be required to register with Home Builder Registration Unit of the Office of Attorney General. A subcontractor may not be able to get into contracts with a homeowner. A subcontractor may only be able to work for a contractor who is licensed. An individual may only be able to be licensed to represent two contractors who are licensed in regards to selling home improvements. Experience, Exam, or Education: Are There any of These Requirements for a Contractor License in Maryland? Each applicant who is seeking a contractor license will be required to provide proof for the prior two years of experience with construction, improvement work, or any related education. If a contractor is representing a corporation, a certificate and articles of incorporation of good standing will be submitted from the Department of Assessments, as well as Taxation. A contractor who will use a trade name will need to check with Commission to ensure that the name will be available prior to registering the name. The name will be registered with Department of Assessments and Taxation. Along with a license application, there needs to be a certificate of a trade name registration that needs to be submitted together. Proof is needed of having $50,000 liability insurance, and it must be filed at the same time as the license application. Maryland License: Is Liability Insurance Required? Contractors must show proof of current $50,000 liability insurance at time of application for original and renewal license. This insurance must be in effect at all times. As of October 1, 2002, contractors must give the Commission notice of cancellation of liability insurance at least 10 days before the effective date of the cancellation. Contractors will be require to show proof of having liability insurance of $50,000 during the same time of the application, as well as for the renewal licensure. The insurance is required to always be in effect. Starting October 1st, 2002, all contractors had to give the Commission a notice of cancellation for liability insurance ten days prior to the date of cancellation. Written Proof of Misdemeanor: Will it Need to be Sent With Application for Maryland License? An applicant who has ever received a conviction due to a misdemeanor in regards to a felony or home improvement transaction will be required to provide the Maryland Home Improvement Commission, along with a copy of the conviction records. For any licenses that are sent out before July 1st, 1999, each individual who holds a license was sent out a renewal date, which must be renewed once each two years. Any licenses that were obtained after July 1st, 1999, the license period would have been two years following the date of the original license. No temporary licenses are issued any longer. Temporary licensed were removed by the law in the year of 1999. Each applicant is require to complete and pass the licensure examination prior to applying for the license. Each applicant who has ever received a conviction for a misdemeanor in regards to a felony or a home improvement transaction will be required to provide copied of the conviction records to the Commission. The license for Home Improvement does not include new home construction. Each builder who I going to build a home in Maryland is required to be registered with Home Builder Registration Unit. You can expect approximately eight hours for the prep courses in Maryland. Contractor Continued Education: Is it Required in the State of Maryland? General Contractor Commercial Contractor License: Is This a Requirement in Maryland? 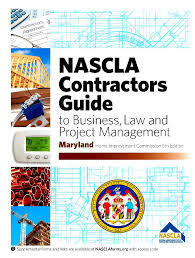 NASCLA Accredited Commercial Contractor: Is This a License That is Accepted in the State of Maryland? As of March 19, 2008, producers are no longer required to provide their SSNs to CE providers or to Prometric. Effective October 1, 2013, the 50% limitation on self-study courses has been removed. Producers may now take 100% self-study courses towards their CE compliance. If prior to October 1, 2008, a resident licensee has been consecutively licensed for 25 or more years their continuing education requirement is 8 hours. Of the required hours of Continuing Education for all resident producers per renewal period, at least 3 hours shall relate directly to ethics. Verifiable self-study courses for continuing education are acceptable if the course has been submitted for approval by an authorized provider. Question: How do I register my construction company in Maryland? What forms do I need to register my new company in Maryland? Question: How do I look up a company in Maryland or see if a company name is available to register?